Sorry for not posting for so long, I've been a bit busy. I just realized how long it's been since I've done a Feathers on Friday post. Yesterday migration finally came in earnest. 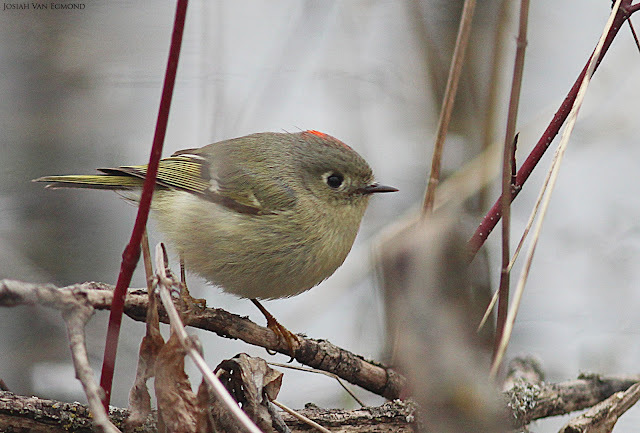 Golden and Ruby-crowned Kinglets, Yellow-rumped Warblers, Yellow-bellied Sapsucker, Brown Creeper, Song Sparrows, Flickers, Cooper's Hawk. The weather is finally warming up. But here is a photo from a while ago, a Pine Grosbeak at the feeder. A few days ago we saw a medium sized owl fly out from the trees, actually quite a familiar sight for us. It was a Long-eared Owl! The past two years a pair has come back to our yard, and last year they nested right in our forest! This is the third year they have come back, and it's pretty exciting! Now to see if they will nest in our yard like last year. I've also seen the Cooper's Hawk, which has been coming back to our yard for years and years.